Although it rarely is part of the Open Water certification course, selecting and setting up a base camp is a skill that every diver should be familiar with, even if shore diving is not in his/her immediate future. A base camp is the center of operations when diving from shore. It’s a clean, dry and secure location where divers can unpack their gear bags, assemble their scuba units, review the final dive plan, change into exposure protection, don and doff dive gear and leave spare weights, car keys and emergency equipment. 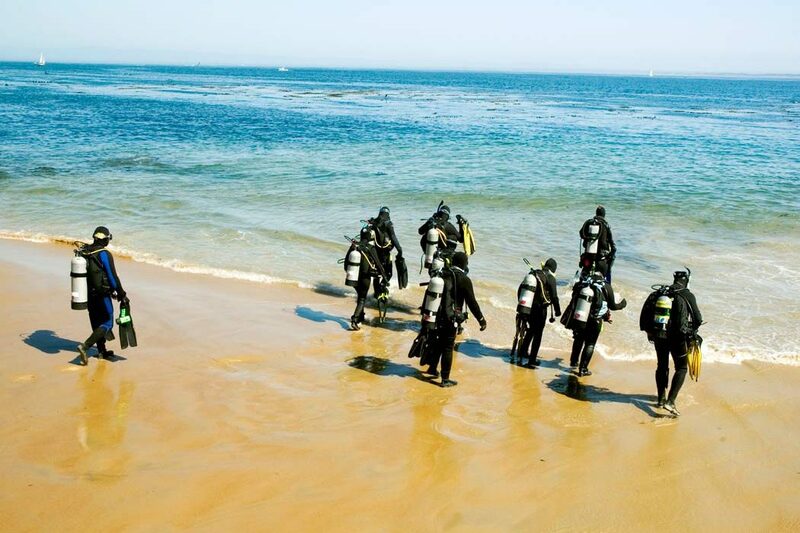 Divers sometimes use their vehicles as the base camp for shore diving — suiting up at the vehicle and walking in full dive gear from the parking lot to the water’s edge. This works fine when parking is near the dive site. However, the farther the entry point from the parking area, the more advantageous it is to set up a base camp along the shore. Between dives, rather than trudging all the way back to the car to switch tanks, divers who use a shore base camp simply doff their scuba units at the camp, change tanks and spend the surface interval enjoying the scenery. As they say in real estate, “It’s location, location, location.” Choosing the right spot to establish a base camp for your shore dive is an important task. Select a location that affords an unobstructed view of the area being dived and is near where you will enter the water, but not so close that incoming tide will reach the camp before your dive is over. When shore diving, always identify the high-tide line and know the tide schedule. This is especially critical when diving in areas that experience significant tidal change. A change of only a foot or two (0.3 or 0.6 m) can translate into 20 or 30 feet (6 or 9 m) of sand on a gently sloping beach. It is conceivable that you could establish your camp 30 feet (9 m) from water’s edge and return from the dive to find your belongings being washed about by the tide. Use common sense and courtesy when choosing a location. Select one that is unobtrusive to other beach users. Avoid heavy foot traffic locations. Think ahead; the shoreline may be empty when you set up camp but consider what it will be like when the sun breaks through the haze and sunbathers begin arriving. Don’t establish your camp near a beach volleyball court or other sports area. If diving from a crowded beach or shoreline, choose an area off to the side — one that will least affect other beach users. The heart of a shore diving base camp is a good ground cloth; most divers use some sort of tarpaulin. The 8-by-10-foot (2-by-3-m) or larger size is a good starting point, and then add additional tarpaulins as the number of divers increases. The ground cloth provides a clean, dry location upon which to prepare for the dives, don and doff your equipment, relax during the surface interval and repack your gear for the trip home. The ground cloth must be durable enough to withstand divers walking on it and tanks, weights and dive gear being moved around. The material should be of sufficient density that sand, dirt, water or mud will not penetrate. If there is wind, and there often is near open bodies of water, you’ll need to secure the cloth. Place spare dive weights on each corner or drive tent stakes through the corner grommets to hold the cloth in place. Every base camp should be equipped with a diver’s first-aid kit and a spare-parts kit. The parts kit should include the following: spare tank O-rings, generic mask and fin straps, mask defogger, a snorkel keeper and regulator mouthpiece, cable ties (for mouthpieces), octopus and gauge console fasteners and the tools for making minor equipment repairs and adjustments. A spare mask and set of fins could also come in handy. Having spare parts and equipment available at the camp eliminates having to abort a dive if something breaks. The base camp provides a clean, organized setting for predive, post-dive and surface-interval activities. The ground cloth is intended to keep your gear off the ground, so make every effort to keep the cloth clean. When delivering your equipment from the parking area, set gear bags and tanks on the perimeter of the ground cloth to avoid tracking in mud or sand. When ready to assemble your scuba unit, remove or at least clean your shoes before walking on the cloth. A similar procedure can be followed when returning from a shore dive. To avoid tracking sand or mud onto the cloth, place your scuba unit on the outer edge then sit on the cloth and remove your dive booties, before walking on the cloth. Make every attempt to keep the ground cloth dry. When returning from a dive, drain the water from your gear and empty water from your dive booties before placing them on the cloth. Keep the base camp organized. Each diver should stake claim to a portion of the cloth and keep his or her gear in that area. Part of the base camp should be designated a dry area where the items everyone wants to keep dry are placed. Deploy an official trash receptacle at the base camp. After breaking camp and folding the ground cloth, make a final survey of the area to ensure that nothing has been left behind. Always leave the location cleaner than you found it. When possible, a camp tender should man the base camp. This person is responsible for keeping watch over the spare gear and personal items, and is available to summon assistance in an emergency. The camp tender should be equipped with a cell phone, know the location of the base camp and the number of the cell phone from which he is calling, and be able to provide emergency personnel with detailed directions to the site, if necessary. When calling 911 from a cell phone, you may connect with a dispatcher outside the local emergency management system (EMS) area, so check in advance if there is a non-911 emergency number that you should be calling for emergency assistance. The camp tender also should have the DAN (Divers Alert Network) emergency and consultation numbers readily available. When a cell phone is not available or cell service does not exist in the area, know the location of the two nearest working telephones (i.e. a restaurant or convenience store). A base camp for shore diving takes on an added function when diving at night. First, the base camp should be adequately illuminated. Many divers use battery-powered lanterns to provide light for assembling gear and gearing up. The base camp should be identifiable to divers surfacing off shore and those exiting the water. This requires distinctive lighting. A set of range lights should be positioned so they lead divers back to the camp. Place one light at the water side of the camp and another near water’s edge. The lights must be in line and both visible from the water. Divers who surface looking for the exit location or those exiting the water can move laterally along the shore until the lights line up. Then they simply swim or walk toward the lights, keeping the two in line. When diving where boating is permitted, do not use red or green range lights; they can be misinterpreted as marine navigation lights. You may not have learned about base camps during your Open Water certification class, but knowing how to select and set up the proper site could mean the difference between an uneventful shore dive and exiting the water to find your spare gear and belongings floating in the surf. For more information and supervised practical experience, enroll in a shore diving specialty course.